The popular messaging app Telegram seems on track to reach its goal of raising $1 billion for its ICO to create the TON network. According to new filings, Telegram has already reached its first milestone for its initial coin offering (ICO). The messaging app intends to raise $1 billion and has so far raised $850 million. Telegram Open Network is designed to host a new generation of cryptocurrencies and decentralized applications. The US Securities and Exchange Commission (SEC) received a document earlier this week which confirmed that the money raised during the ICO sale will be used to establish and develop the TON blockchain network, as well as further develop the Telegram Messenger app and platform. According to the filing, the ICO’s security includes purchase agreements for all crypto transactions. The document was signed by Pavel Durov, the CEO of Telegram. Telegram has managed to raise over $850 million while still only in its pre-sale phase of the ICO. The campaign was mostly directed at prominent investors, entrepreneurs, and a few selected venture capital firms who were given exclusive access and added incentives to invest in the Gram Token. While the pre-sale aimed to raise only $600 million, this figure quickly skyrocketed to $850 million due to demand in the industry. According to the messaging app’s whitepaper, they intended to have another sale phase during March to raise an additional $600 million, however, this figure might be adjusted considering its highly successful pre-sale phase. Bloomberg speculated that considering the high demand for the Gram Token, the public sale could reach as high as $1.5 billion, which means that Telegram could soon raise $2 billion to develop its TON network. Even if this number is not achieved, the Telegram ICO is likely to go down in history as one of the most successful ICOs as the pre-sale total alone, tops most other completed ICOs. 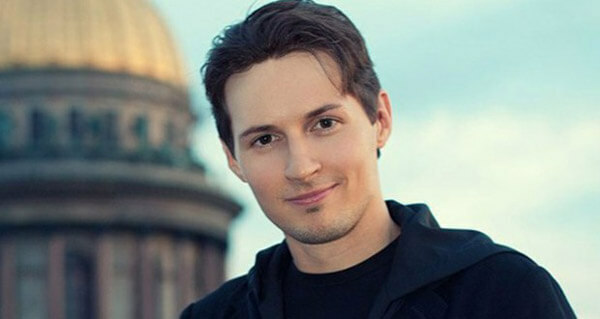 Pavel Valeryevich Durov is a Russian entrepreneur who is best known for being the founder of the social networking site VK, and later the Telegram Messenger. He is the younger brother of Nikolai Durov. What makes this ICO significant other than the staggering figures raised so far, is the fact that this ICO marks the very first time that Telegram is accepting outside investers. So far the messaging app has been funded by CEO Pavel Durov and his sibling Nikolai. The two brothers previously co-founded the Russian social media platform, VKontakte, and has since fled Russia following a dispute with investors. The demand for their ICO sale has been extraordinarily high, partly because of Telegram’s place in the crypto world. Several crypto and ICO projects use Telegram as a means of communication to interested investors which has placed Telegram in a unique position to catch the attention of avid crypto enthusiasts. According to Quartz, those who have already invested in the Gram Token have already sold their tokens for double its price, while others completely declined to participate due to the overhyped nature of the ICO. In addition, there have been reports of would-be scammers who set up fake websites to mislead investors. A platform for creating decentralized apps, web browsing, and create smart contracts. A service that enables peer-to-peer micropayments. The first version of these services will launch in the second quarter of 2018 along with Telegram’s own wallet service. However, more services and features will be introduced throughout 2019. For more information about the Telegram Open Network, please see our coin profile.